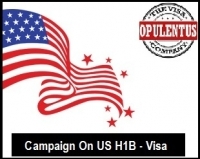 Numerous organizations belonging Indian-American have called for the campaign with the administration of Obama inorder to take up issues of H1B visas. Annually, the immigration reform and visa backlogs do affect the Indians. The GOPIO-New York (Global Organization of people of Indian origin), SACSS( South Asian council for Social services) and Kerala Center organized and an immigration seminar here are recently have discussed various immigration issues that impact the H-1 B visa holders from our nation, India families settled having Indian origin in the US. The participants at the discussion have noted that H-1B visas do continue to be scrutinized heavily by agencies such as US Dept of homeland security, US Dept of state and US dept of labor. Largest users of H-1 B visa have significant technology companies belonging to India and do have grassroots efforts are made to help the govt understand that our nation is not the only user of these particular technology visas. The panelist added, we find attempts are made to avert a form of reverse discrimination to be undertaken at earliest. They have noted that it is the time that the US does include India in treaty investment and also under treaty trader category for immigration visa purpose. Adding that this has been a source for great of frustration between US and India for numerous years. The seminar also felt that the need for grass root actions inorder to support the executive actions of President Obama was announced in the month of November in 2014. While we find immigration reform holistically seems to be stalled. The Obama executive actions are designed in piecemeal offer that aims in improving the overall immigration law system, the GOPIO has said in a statement. On extreme backlogs for nationals belonging to India in varied visa classifications, the panelist said these backlogs have resulted in families getting separated for a longer period. One of the major tenets underlying the US immigration law is family unity. It does continue to be our hope that these backlogs can get reduced in some fair manner. The GOPIO’s founder president Thomas Abraham added. The GOPIO, as well as other community groups, have vowed to campaign with Obama administration and get elected officials on these issues.